Cora Crocus, despite her recent rise to Yard Yeti Extraordinariness, remained a stickler for structure. Each and every night before she closed her storybook bungalow, Cora ran her fingers over the spines of the books on each shelf, secure that not one felt superior and stuck out beyond its neighbors. For the past three nights, one book, with its deep chocolate leather binding, magically, though untouched, sat perilously close to the edge of the shelf. Cora would raise one finger and gently poke it back in line. However, on the fourth night, Cora Crocus poked a touch too hard, and the slim chocolate covered rascal escaped and fell to the floor. Cora swore she heard a tiny whisper that sounded vaguely like...I win...said with a grin. Cora crouched and squinted in the late afternoon shadows to read the title. Subject: Yet to be determined. But from the smooth gleam of the lettering and the pristine perfection of the creamy white pages inside, Cora surmised that perhaps it was a first edition. A one of a kind. Or the one and only manuscript published and never read. Cora tucked the slim volume under her arm, grabbed her bag, turned the key in the lock and made her way home under the light in the window of the studio over the Ace Plumbing Store right next to her shop. She paused a moment in the twilight, not for the first time berating herself for not climbing the flight of stairs, rapping on the door and introducing herself to her neighbors. Spring had arrived and with it the days gradually lengthened, allowing Cora to sit on her covered porch, deep down in her adirondack chair, slipping off her yellow wellies and wiggling her bare properly painted pink toenails in the air. She lit the kerosene lamp on the table next to her, and sipped her tea as she opened the book and began to read. To say it was a quick read, a slightly satisfying morsel of a book, would be cruelly unjust. A book filled with the sweetness of a life well lived. Rich and tender love stories of family and friends. Simple touching remembrances, illustrated in a child’s hand, soft looping figures with arms draped around one another, hugs abounding, tender kisses of hello and good-bye. Loved ones held dear, happy laughter and giggles. The sounds of contentment and small fulfilling joys. Like an open box of candy, each page a different treat. A vanilla sky, a strawberry summer, a lemony sunset. Sweet. Sweet. Sweet. Empty calories that should pile up on her hips, Cora thought. Until she noticed the four or five pages stuck together, at the end of the book, now sitting in her lap, dismissed as a fable, a fairy tale, chick lit at its worst, an optimist’s flight of fancy. Not the real world surely, no, no one could write a story so sickishly sweet. In truth, Fannie’s life was less than sweet. But no more and no less awful than any other. Actually, Fannie’s life had more downs than ups, and she had spent much of it climbing enormous piles of resentments and fears and hurts. Then, under the guise of a therapeutic strategy, she began to walk around the piles. Ignored them. Pretended they didn’t exist. But as we all know, the way life works, it intrudes and kicks us in the shins even when we are being very very good and very very careful. So it should have been no surprise when Fannie swerved to miss one pile and landed hard on another. Thinking herself a clever girl, Fannie decided to make herself an enormous coat, with extremely deep and matching pockets. She resolved that she could not, would not have bloodied knees, if she just carried the piles around with her wherever she went, so she could keep an eye on them. Fannie nodded and reached out to take the claim check. Written on the cardboard stub was not a number. Written in a floral flourish, one word. That what is sweet about our lives is right here, right now. Cora closed the book, but only after she stuck a post it on the cover as a reminder. On her way to the bookstore in the early morning light, she would leave it near the door of the studio above Ace Plumbing with a bookmark inside, and a box of her favorite chocolates. 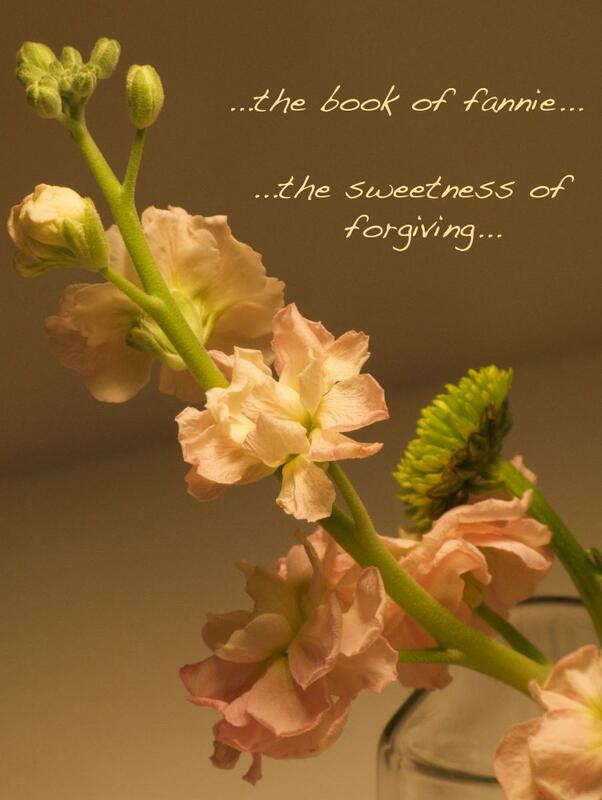 Sweet Somethings and Sweet Nothings from your friends, Cora Crocus and Fannie Freesia...Welcome to the Neighborhood.